The Smart Growth goals refer to "steering growth away from significant agricultural land." Before decisions can be made on how to do this, there must be agreement on what constitutes "significant" agricultural land. ...land that includes specialty crop lands and/or Canada Land Inventory Class 1,2 or 3 soils in this order of priority for protection. a combination of farmers skilled in the production of specialtycrops and of capital investment in related facilities and servicesto produce, store or process specialty crops. These definitions in the PPS identify land that must be considered forprotection in regional and local planning policies. Municipalities can be,and often are, more rigorous in the definition of prime land. They cannot be less rigorous than the PPS. Marsh, are in a separate category and qualify as specialty lands under the definitions in the PPS. The CLI designations for the zone are shown on Figure 2. The problem with using the CLI for designating land is that the CLIclassification is based on the ability to grow common field crops. It does not take into account local conditions or the varying requirements of different crop types that may elevate the importance of certain land for agriculture, whatever its CLI designation. The material available as the basis for establishing the appropriate designation varies by age and region. For some areas very detailed current soil data is available, in others it is not. Use of just the CLI does not account for factors such as the critical mass or access to support services required for agriculture to be successful. Classes 1, 2, and 3 land may be interrupted by pockets of Class 5 and 6 land which are not protected. For optimal production, farmers need large contiguous areas, not fragmented fields. Protecting Classes 1 to 3 and allowing intervening areas to be developed fragments an agricultural area, introduces conflicts, and reduces the critical mass of agricultural activities required for efficient operations. A more comprehensive approach to designation is needed. Alternative methods for assessing land do exist and in some municipalities have been implemented. The Agroclimatic Resource Index (ACRI), for example, provides a measure of land capability. It is calculated by considering growing season length, temperature, and moisture as they relate to forage yields. Using this system, it can be determined that from 1966 to 1976, a census area in Alberta experienced a net gain in total farmland of 76,704 hectares with an ACRI of 1.2. During the same period York and Peel Regions reported a loss of 41,079 hectares with an ACRI value of 2.5. Multiplying the area by the index shows that these changes represent a net loss in capacity. Land gained in Alberta multiplied by the index equates to 92,045 ACRI. 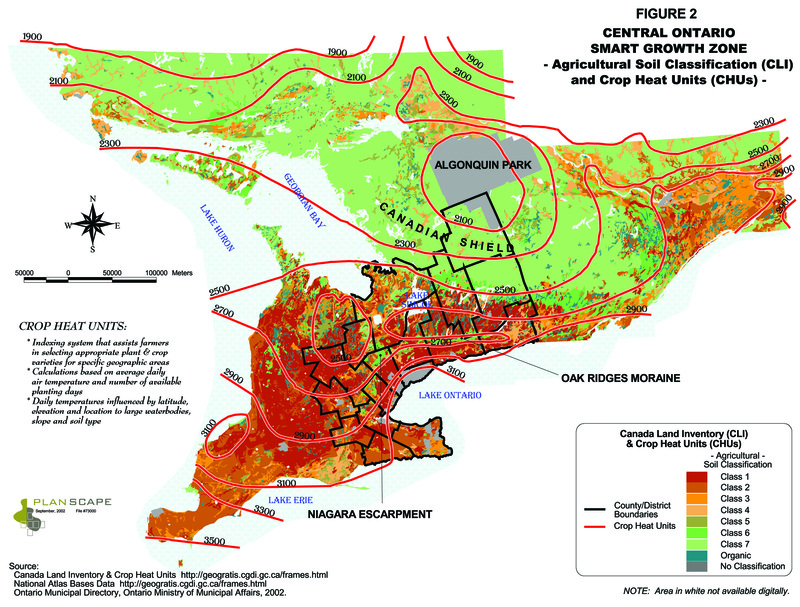 In York and Peel, the relative value of land lost is 102,698 ACRI. This type of calculation needs to be done to understand the relative value of the land in terms of productive capacity. The new approach, entitled "The Land Evaluation and Area Review (LEAR) System for Agriculture combines land evaluation with an area review. The land evaluation includes rating of the soils within the study area; the area review generates ratings that factor in social, economic and environmental elements. The system can be modified to reflect specific local conditions but has sufficient rigor to protect its integrity. It is intended to be used for comprehensive planning reviews, not to evaluate specific applications. This is consistent with the need to evaluate agricultural land on a comprehensive, not an ad hoc basis. Local municipalities have always had the option to implement a more rigorous analysis and designation of prime land. Many have done so and have implemented policies that are fairly stringent in protecting large contiguous agricultural areas. Niagara is an example of where this has been done quite successfully. However municipal policies can be challenged and the challenge substantiated by the PPS. Because of the fragmented geographic nature of the municipal structure, a municipally based approach does not result in a comprehensive evaluation across the zone. Given the fundamental societal value of agriculture and the fact that the land base is limited, a more comprehensive evaluative process is appropriate. Introduction of the LEAR system could be the beginning of this. It allows the CLI to be a starting point, with other conditions that contribute to agricultural capability being factored in. This type of evaluation should be done on a provincial, or even national basis, resulting in a tiered policy framework based on a comprehensive and progressively more rigorous evaluation. The detailed municipal evaluations could then fit into this comprehensive framework. A broad picture of productive capability, and a firm basis upon which to establish what land is significant would result. 4. Ontario Ministry of Agriculture and Food, "A Guide to the Land Evaluation and Area Review System for Agriculture" June 2002.